Until 1958 the CAB also controlled safety issues. The CAB's mandate was initially to enable 'sound development' of the industry whilst promoting adequate, economic and efficient services. Though not technically stopping new entrants, and competition, the CAB effectively did both as the barriers to entry were set so high as to be realistically unattainable. This was partly as all CAB decisions centred around individual route applications and part of the application required an airline to have proven capabilities to provide the service, which of course no new airline could ever have! Effectively all the existing airlines operating major trunk routes were grandfathered into the new system and the only real changes that an existing airline could make were by slow and painful route applications or the takeover of a failing airline (applications to merge two healthy airlines were almost always rejected). The CAB also required a new route entrant to be able to prove its new service wouldn't harm the incumbent which severely limited the ability for competing services to exist plus in general the CAB wanted to limit the number of airline's serving a market anyway. In general operating an airline in the regulated market was quite easy and you had to be doing something seriously wrong to be losing money on a regular basis (still several airline's managed this). The existing airlines were able to compete only on service and equipment, which tended to create a completely artificial view of the marketplace and would leave several of the incumbent airlines woefully ill-prepared for a deregulated market. The causes of deregulation are complex, however the heavy handed and blinkered mindset of the CAB was a major factor. For example over 75 non-trunk airlines had applied for trunk routes since 1950 and not one had been approved for service. A lack of competition did little to make the airline's interested in efficiency or innovation whilst the unregulated intra-state airlines often shone a harsh light on their regulated big brothers. Additionally the economic and political background of the 1970s was one of deregulation and decreased state control. 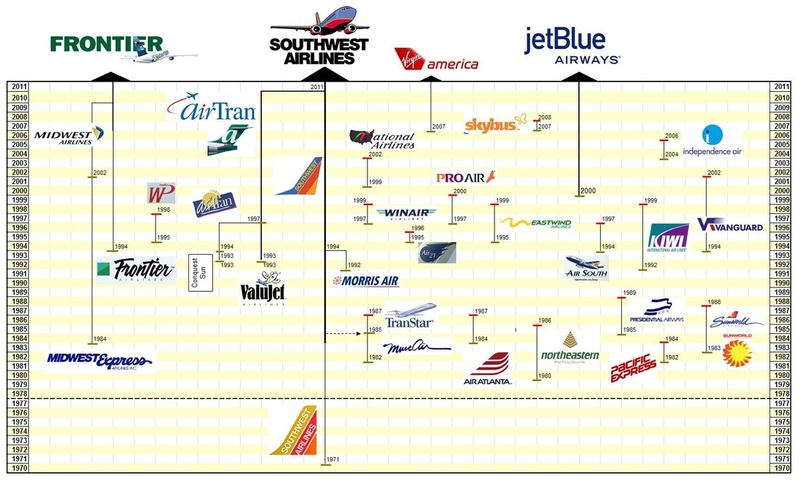 The majority of the major trunk airlines didn't welcome deregulation and Braniff was so unsupportive as to refuse to believe it would continue even after it happenned (their landgrab expansion in preparation for reregulation was a major cause of their failure). Rather than introduce massive competition into the market the eventual result has been the production of a handful of mega-carriers dominating the marketplace. On the flip side deregulation has enabled vastly more people to fly more cheaply than before, more efficiently without compromising safety standards. This has however come at the expenses of much turmoil and regular bankruptcies. Though the three biggest surviving airlines in 2014 are American, Delta and United the true winners of deregulation have proven to be innovative airlines like Alaska and Southwest who have survived, grown and prospered in the new landscape.